Some key indicators, SCC at current price of RM1.95, the PE is 13x with ROE at 17.75%. The NTA is RM0.88 sens and average 7% revenue growth. However, the quarter 1 is always weaker that is all. Yet despite a weak quarter, SCC delivered a strong topline figure. My exact words in my earlier analysis was "After reading deeper, I realise the reduced profit margin is also due to the fact SCC introduce a new product segment, which allowed the company to sucessfully increase revenue by a quantum leap. As a result, with the new product segment, I believe SCC will be able to maintain the current performance and obtain better growth moving forward. Once SCC find their footing in the new product profit margin, bottomline will reflect accordingly." This was accurately reflected in the prospects review in the recent report below. It was spot on. My exact words in the earlier analysis "Traditionally, the average revenue for SCC stands between RM35-40 million. For 2015, there is a huge leap towards RM60 million. However, there is a steep drop in profit margin. Without even going deep in the report, I suspected the reason was FOREX. MYR weaken substantially and as a result, the margin eroded from an average of 14 to only 10.6. We know for 2016, MYR has somewhat stablise. For many businesses, stability is most important as it allows the business to determine its pricing strategy. I believe for 2016, SCC will be able to navigate FOREX implications better than 2015." Again this was spot on here. I also have not seen such a bullish prospects review since FFHB. If SCC exceeds the performance of 2015, it would mean my FV should be adjusted further upwards. However, taking into consideration of the current business climate, I rather maintain my earlier TP to be conservative. SCC did a fixed issuance at RM2.09. That would mean the company is valued at 2.09 and is expected to complete in June 2016. Hence, the estimate value of SCC should be at least RM2.09 if not it would be be fixed at such price. This can act the base price for investors to use to gauge the value of the company. Additionally, be it Bumi investors or any investors to even be attracted to take up shares in a company, the share price must be valued fairly if not no sane investor would be willing to part with their money. Steady payout of average 4.5% dividend for the past few years. Currently, there is no special dividend issued but only an interim unlike last year. The key word is interim. If there is interim means there would final right? I believe SCC will maintain their 10 sens dividend a year and breaking it into two portions for distribution to shareholders is actually a good measure as it sustains interest of shareholder to hold it for longer term instead of only once a year. Additionally, breaking the dividend into two tranches show effective cashflow management and confidence in its ability to maintain the payout twice a year consistently instead of one off year end special dividend which is highly discretionary subject to the year's performance. 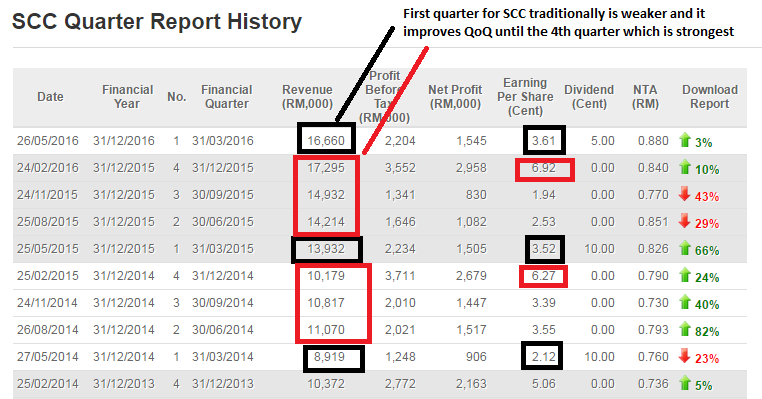 I maintain SCC is able to maintain their growth of around 7% for the revenue for 2016 and lift their profit margin to around 10-12. 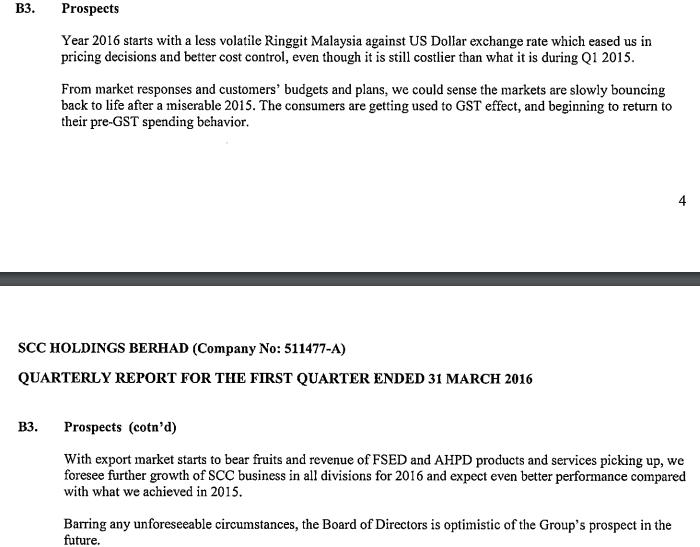 As such, the target EPS for 2016 is around 18 sens. Applying a multiple of 13x, the fair value would be RM2.34. Coupled with the annual dividend payout of 10 sens, the intrinsic value should be around RM2.44. This is excluding their potential future growth which will be revisited in the coming quarterly results. I am extremely conservative and at current price of RM1.95, it is a no brainer to collect SCC. However, be warn the holding period should be at least 6 months.